I've been turned onto the love of wordpress. Mostly because I've always found Blogger a little irritating. Dear Vacation, you are FINALLY HERE. I love you. Dear airplane outfit, I love your comfort and casual stylish appearance, but it is too hot in this airport. Dear hair, please don't turn into a lion's mane while I'm on vacay. I kinda want to look cute. Dear cute boys who make me smile, thanks. Dear airplane, please don't be full. I kind want some space. Dear legs, this lack of running while on vacation is not a permanent thing. We will be picking up where we left off when we return. Dear bus that almost hit me yesterday, thanks for not killing me. I have a lot of things to look forward to. Dear beach, you and I will be BFFs for the next week. I probably won't be posting, but I hope everyone has a great weekend!!! 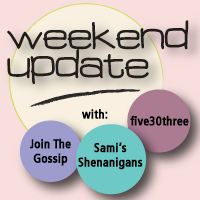 Today was super busy and super slow, so enjoy the weekend update. 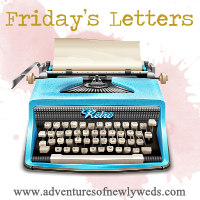 Blog Hopping for "Weekend Update"
As always, my weekend was pretty relaxed and low key. I'd take him ANY DAY over ANYONE. I ran 6 miles, not consecutively, but I ran it. I lifted, heavy, for my back. Then I did some shopping. 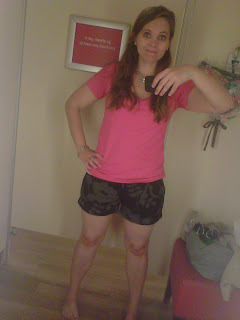 I finally found shorts that I like. Yes, I am in a TJ Maxx dressing room trying on my Old Navy shorts that I had bought the day before. And please ignore my weird face, apparently I make weird faces all the time. These actually fit me pretty well. I just wish they would have had the green pair in my size. They were all only $6.99, what a steal! I also started packing for my vacation. I like to make lists for packing, although I don't ALWAYS follow them. This is an old list, but you get the idea. Color coding is always more helpful. And these are my suitcases (although these pictures are also old, sorry, my camera battery is dead). I'm mostly done packing, I just have some laundry that I need to finish. Its nice to pack bathing suits and dresses and sandals. It is much more fun than winter clothes. In case you need some uplifting words of encouragement, check out these videos and this website. It is so important to live in this world, but not of it. To be less selfish and self-centered, and more God centered. To not only know it, but to live it. It is more than going to church, but to live what you're taught. To pray about everything, no matter what. In happy times and in sad times. When you want something and when you NEED something. And it is okay if you haven't done that, you can make the change. It is okay if you slip and you fall, it is a rocky road, and if it wasn't, Jesus would have never come to die for OUR sins. Be inspired, and remember who comes FIRST. I can't wait to lay on the beach, read, and do nothing. 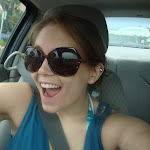 I've been creating my perfect, beach summer playlist. This post is kind of all over the place. I'm pretty obsessed with Katy Perry. I've posted about her before here. Anyway, part of me wants to go see her movie, but I'm kind of embarrassed. I mean, she's so fun and adorable, right? 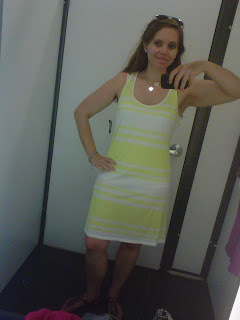 And finally, I might go back and get this dress, if I can find something to wear under it because in person you can see my undergarments, and that's not the kinda girl I am. I know its kinda plain, but I think it is really comfortable. 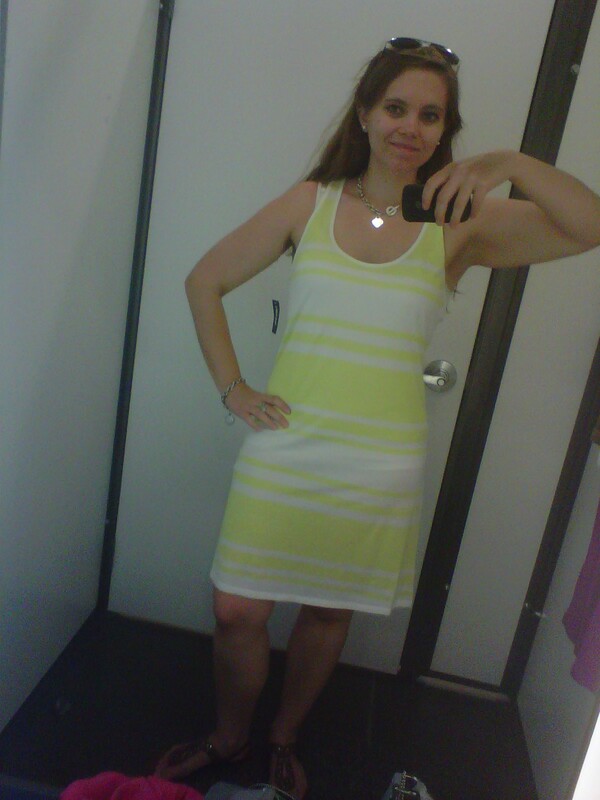 And I don't wear a lot of yellow, so it is kind of different for me. Dear Vacation: Couldn't I be leaving today? Dear Cute Bathing Suits: Please be on the racks in my size this weekend. I'm tired of find THE ONE and it being too small or too big. Dear San Diego Weather: It is July, did you not know that? No more of this June Gloom and May Gray. Please and thank you. 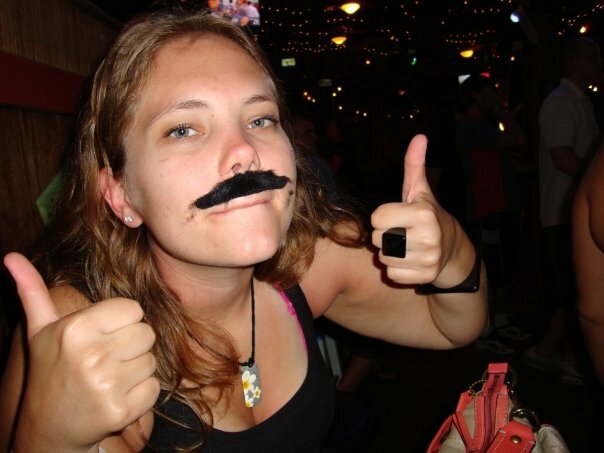 Dear Bachelorette: Emily, you make me want to throw up. I mean, I think you're cute, and all, but something about you drives me crazy. And get it together, Arrie is a creep, Jef is a baby, and Sean is where it's at. Enough said. Dear Mint Chocolate Chip Ice Cream: I was craving you for weeks and thought I could go without, but I couldn't. So I caved and now you're all I think about. The worst part is, you're not even my favorite! Dear Life: Let's kick it in to high gear. I want to have some fun and smile more. I mean, I smile a lot, but I want more reasons to smile. Dear Country music: Thank you for getting me through each and every day. You make my head and my heart smile. I really need to go line dancing or something, because I really keep thinking about it. I love 4th of July, it is one of my favorite holidays. I don't really know why exactly, but I do really love it. I think because it SCREAMS summer. I ALWAYS wear red, white, and blue. I support our country to the core. And this is the only song you need to listen to today. Repeat, I tell you, repeat. I apologize for the poor picture quality, I tried to fancy it up to make up for it. Aviators are a must on the 4th of July. Red sweater, check. White cami, check. Blue shirt, check. Grey shorts and cute sandals, check, check. Have fun, be safe, enjoy a few beers, burgers, and some fireworks.